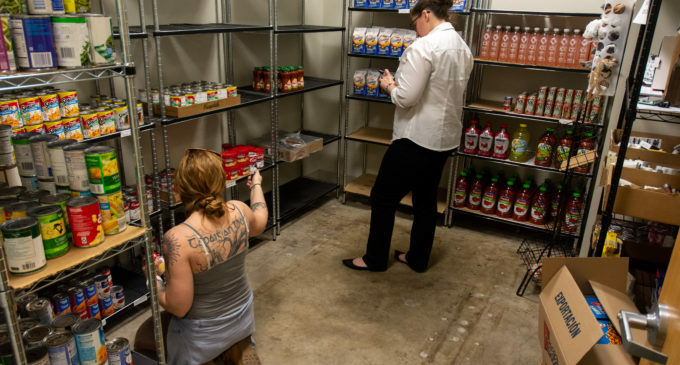 Students who visit UNT’s food pantry will now be provided with a $20 weekly meal plan developed by the Student Money Management Center after the Dean of Students Office reached out for help. Rachel Grimes, assistant director of financial readiness at the Student Money Management Center, decided other students could benefit from the meal plan as well and implemented it into a campus-wide workshop that took place last night. Rosie Ridgeway is the student withdraw coordinator at UNT and also oversees the campus food pantry. Image by Will Baldwin. 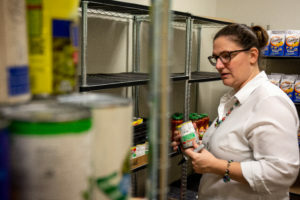 In response to the growing number of students who faced food insecurity, UNT opened a food pantry in 2015 and has had 5,600 visits since then, Student Services Coordinator Rosie Ridgeway said. “We have seen many students who are struggling with food insecurity while working full-time, taking a full-time class load and trying to make ends meet,” Ridgeway said. The majority of students who visit supplement two to three meals with goods from the pantry and usually need the services on a temporary basis. Ridgeway emphasized that students will always have a private and easy experience. “We work closely with students to overcome barriers that prevent students from achieving their academic goals,” Ridgeway said through email. Drawing and painting senior Julie Do said that she has been left with little money in her bank account a couple times after paying her bills. Feeling hungry, Do said she decided to visit the food pantry that was advertised on flyers she saw on campus. Based on her experience, Do had assumed not many students were aware of the pantry. For a week during the fall, Grimes and another mentor from the Student Money Management Center followed a $20 meal plan they found online and later discussed their results on an episode of their podcast, “Mean Green Money.” The meal plan they followed included foods such as rice, beans, potatoes, chicken and eggs. “We ate a lot less meat than we would normally, so that’s one of the fastest places where we cut money,” Grimes said. Student Assistant Kelsey Glass stocks UNT’s food pantry with donated goods. Each item is labeled with a letter indicating the food’s expiration date. Image by Will Baldwin. Grimes said the meal plan would be doable for the average college student depending on his or her activity levels, available time to prepare the meals and whether the student already owns certain ingredients, such as olive oil. “I think it’d also be hard if you were living in a residence hall or if you didn’t have a whole lot of cooking utensils in general,” Grimes said. Do, who budgets $50 per week on groceries, said a meal plan like the one Grimes followed would force her to “look into nutrition and sustenance” and although she said she is not aware of the severity of friends’ situations, she often hears them mention they are hungry, starving or broke. “I feel like a lot of people are struggling but they don’t really know any other means of making it easier on themselves other than just ‘sleep for dinner,’” Do said. Grimes said she believes that since the food pantry opened, the community has become more comfortable with having conversations about affording food. Featured Image: Rosie Ridgeway (right) and student assistant Kelsey Glass (left) stock the shelves of UNT’s campus food pantry. Image by: Will Baldwin.